From spring fed rivers to Texas-sized lakes, open ocean swims to diving in a pool, Texas State Parks offer a full range of swimming options to beat the summer heat. In the Austin area, state parks such as McKinney Falls, Inks Lake and Pedernales Falls offer an array of rivers and lakes in the heart of the Hill Country. Lyndon B. Johnson State Park and Historic Site opened its public swimming pool last month. Pool hours are from noon to 8 p.m. Wednesday through Sunday. Near Houston, Huntsville State Park and Lake Livingston State Park are ideal destinations for river and lake swimming. If wading close to shore on the open ocean seems more appealing, Galveston Island State Park offers beach access to the Gulf of Mexico. After being battered by two hurricanes, Sea Rim State Park has reopened and is sporting improvements to be enjoyed for years to come. 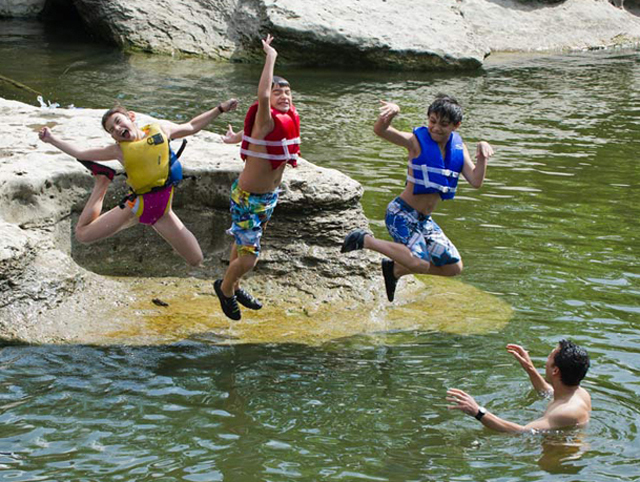 Near Dallas, Eisenhower State Park, Fairfield Lake State Park and Lake Mineral Wells State Park and Trailway offer park visitors a chance to swim in the lakes’ soothing waters, cool off and enjoy a break from the bustle of the city. In West Texas, Balmorhea State Park is home to one of the world’s largest spring-fed pools, with water so clear that many people bring their snorkel gear to experience the underwater world firsthand. The pool stays busy during the summer, so it is best to call the park and make sure the pool is accepting visitors. No matter where you choose to swim, always be aware of your surroundings and environmental conditions, and follow basic swimming safety tips. These tips include wear a life jacket, stay hydrated, swim in designated swimming areas, and heed park signs about swimming hours.